On Wednesday, November 15th, at 6:30 p.m., the public is invited to attend a meeting where the South Castell Visioning Plan will be presented and discussed. This is the fifth in a series of planned public meetings to introduce the community to the visioning process that is underway for the South Castell Ave. area in downtown New Braunfels. The meeting will be held in City Council Chambers at New Braunfels City Hall, 550 Landa Street. As in the preceding public meetings, residents, property and business owners will have an opportunity to see the progression of the plan since the prior meeting and to provide their input. 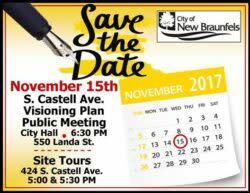 Those wishing to join in a pre-meeting tour should gather just outside the South Castell Ave. entrance to the New Braunfels Civic/Convention Center (375 South Castell Ave.) at either 5:00 or 5:30 p.m. for one of the approximately 30 minutes tours.